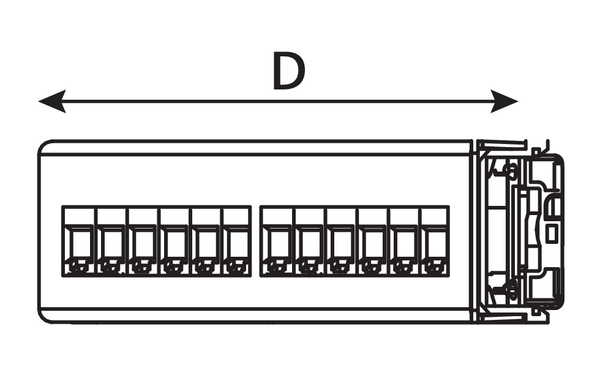 Description The Universal 110 Angled Category 5e range of panels offer exceptional performance and are available in 1U 24 port and 2U 48 port configurations. 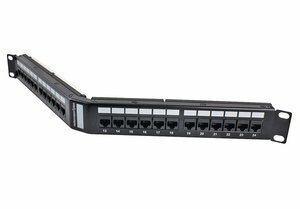 The 1U 24 Port Angled Panel is constructed of 4 modular units, each offering 6 RJ45 ports allowing for any of the 6 port modules to be replaced in the case of damage or failure. The angled design of the panel removes the need for the use of front cable management increasing capacity by up to 50%. The Universal 110 1U 24 Port Angled Patch Panel is supplied with Rack Snap, Cage Nut or 12-24 rack screw fixings and an optional rear cable manager is available. The Universal 110 Angled Category 5e products are designed to support any data or voice protocol that is capable of running over a Category 5e cabling system.